Hot tub maintenance is a scary term for some owners especially if you've never balanced water chemistry or had to clean a filter on your own. The truth is it's really simple to maintain a hot tub and whether you just bought one for your home or you have the pleasure of being able to use one for an extended period of time, we can help you take care of your hot tub. The information on this page is designed to be informative and easy to follow for any owner that wants to take control of maintaining their hot tub, while being detailed enough to be used by spa professionals. There are easy-to-follow instructions along with helpful tips to make hot tub maintenance easier and less time consuming, like schedulers and mobile apps. In addition to making hot tub maintenance easier, you can count on saving money by reducing chemical usage and in some cases electrical consumption by sticking to a hot tub maintenance schedule. Your hot tub will be kept in peak operating condition, helping to prevent costly repairs, extending the life of your hot tub and providing a safe soaking environment! If you are reading this page you have likely been enjoying hot tubs your entire life but never taken care of one on your own. You've possibly enjoyed a hot tub in a tropical resort, ski lodge, or a neighbours back yard patio but now as an owner you need to get familiar with your specific hot tub. There are a few hot tub maintenance basics that should be performed daily as well as some tasks that you will carry out every week, month, every few months or yearly. Let's take a look at the following hot tub maintenance basics first before going over the required hot tub balancing chemicals. Cleaning your hot tub can be broken down into two distinct categories. The first category is cleaning that you carry out when the tub is filled with water and can be done at any time. This can include skimming large debris, usually from the surface that has ended up in the tub when the cover was not in place. You may also want to spot clean with a spa vacuum designed to reach underwater with a pole during operation. This type of cleaner is ideal for debris or bugs that have sunk to the bottom of the hot tub and collected in the hard to reach corners. In addition to spot cleaning we recommend giving the exposed shell, water line and jets a clean with a sponge or cloth. You should use a spa cleaner for some added cleaning power if required. It's important to use a cleaner specifically designed for hot tub or pool applications to avoid adding contaminants to the water that may affect the chemistry negatively. The second category of hot tub maintenance cleaning is carried out after draining the hot tub of all water. This thorough cleaning should be carried out at least every 2-3 months and more often if the tub is being used regularly. It's a great opportunity to give the entire shell a clean, paying special attention to the jets and water line. We also recommend wiping down the cover with a 10% diluted bleach solution and allowing to air dry. In order for your hot tub to stay clean and sanitized, it needs to circulate the water through the filter to rid the water of tiny dirt particles and debris. The average hot tub should run for about 20 minutes, turning over all the water in the hot tub. If your hot tub is larger or your pump is smaller you may need to run your circulation system for longer periods of time. We recommend running your system twice a day, especially when it is being used regularly. The main components of your hot tubs circulation are the pump and filter. The cleaner the filters are kept the cleaner your hot tub will be kept and the less work your pump will have to do. A well maintained filter will reduce the amount of time and money you spend balancing the chemistry of your hot tub. Proper hot tub filter maintenance will require cleaning the filter every 2-4 weeks as well as replacing the old hot tub filter every year or every 8-10 cleanings. Water chemistry is the final category of spa maintenance and it's arguably the most important. Any hot tub professional will tell you that testing and balancing your hot tub regularly is the key to a clean and healthy hot tub. It's also important to remember that a balanced hot tub won't stay balanced for very long if it isn't cleaned regularly or the circulation system isn't working properly. As you learn your hot tub it will become increasingly easier to maintain proper chemical levels by either raising, lowering or eliminating elements in your water. We'll first take a look at chemicals designed to adjust levels followed by a complete schedule that can be followed throughout the season. It's important to keep a supply of hot tub maintenance chemicals on hand in the event that you need to adjust your water chemistry in a pinch. The sooner you react to a level that is out of range, the better it is for the hot tub and anyone using it. 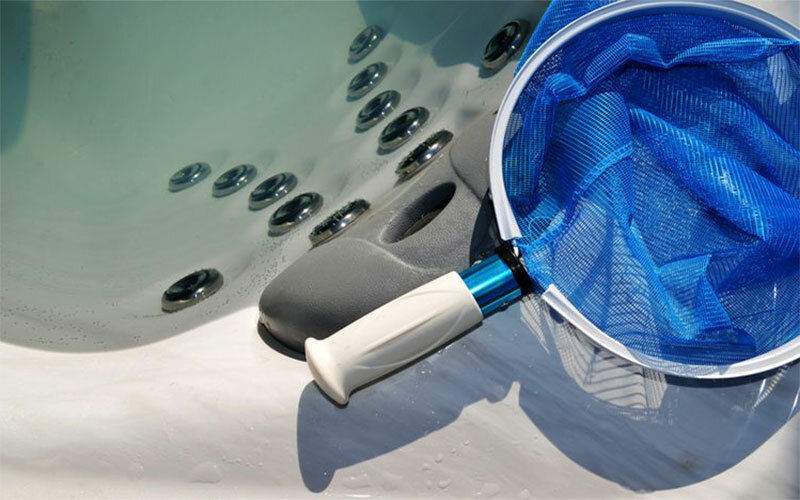 Low sanitizer can lead to the development of bacteria and low or high pH and alkalinity can cause irreversible damage to the hot tub and hardware. Let's go over the chemicals that you will need to keep your hot tub chemistry in check. It's advised to keep the following chemicals together in one place near your hot tub where they can't be reached by children or pets, like a locked cabinet or pool shed. It's worth taking a few minutes to learn about ideal chemical ranges for hot tubs. Hot tub sanitizers come in many forms and they each have their unique advantages and disadvantages. Chlorine is the most popular sanitizer and is the active ingredient in salt water hot tubs while the least popular is biguanide due to its high cost, but it does provide great disinfectant power. Although bromine is a great sanitizer, the main drawback is it gets burned up very quickly when exposed to sunlight. Another option is using minerals like silver and copper to eliminate bacteria, but they can be a bit sluggish to work. With the help of chlorine, mineral sanitizers do pack a very strong one, two punch. The sanitizer will not function and be able to do its job if the pH is not balanced. There is some room for error but you should be aiming for 7.5. If the pH slides more than 0.3 in either direction, acidic or basic, you can quickly run into problems with your sanitizer as well as damage to your hot tub and hardware. If you have high pH you may experience scale formation, calcium deposits or cloudy water. The remedy for high pH is hydrochloric acid, muriatic acid or a pH decreaser. If you have low pH you may experience corrosion to metal parts. The remedy for low pH is sodium carbonate, soda ash or a pH increaser. Alkalinity is known as the pH buffer and plays an important role in preventing pH from fluctuating. If you find that your pH and alkalinity are both needing adjustment, always balance alkalinity before pH. If you can manage to keep these guys balanced you will find that your hot tub maintenance will be reduced drastically. If you have high alkalinity you may experience scaling or cloudy water. The remedy for high alkalinity is sodium bisulfate, muriatic acid or an alkalinity decreaser. If you have low alkalinity you may experience corrosion, staining or green water. The remedy for low alkalinity is sodium bicarbonate, baking soda or an alkalinity increaser. Stabilizer is also called CYA because it's made up of cyanuric acid. It's important because it prevents chlorine from being burned off by the suns UV rays. An outdoor hot tub without stabilizer will lose a large amount of chlorine. It's important not to overuse products that contain dichlor because it contains stabilizer. Every time you use dichlor you are raising stabilizer levels which leads to reduced effectiveness of the chlorine. If you have high stabilizer your sanitizer won't be as effective. The remedy for high stabilizer is draining and adding fresh water. If you have low stabilizer your sanitizer will constantly be struggling to keep up. The remedy for low stabilizer is cyanuric acid. Calcium hardness is the measure of how much calcium is suspended in the water and where the term hard and soft water is derived. Water that is hard will likely contain calcium but it may also contain minerals like aluminum, iron, zinc or manganese. You want calcium in the water so it doesn't leach minerals out of your tub finish or hardware but you also don't want too much so it won't deposit calcium in your plumbing. The calcium levels in your hot tub should not fluctuate very much, if at all, throughout the season unless you are adding fresh water or refilling your hot tub. Since your unique water source in your geographic area will vary from other areas, it's important that you identify through testing if you need to add calcium or reduce it every time you add fresh water. If you have high calcium you may experience scaling or clogged filter and plumbing. The remedy for high calcium is adding fresh water with a lower calcium content. If you have low calcium you may experience corrosion to delicate hardware. The remedy for low calcium is calcium chloride or a calcium increaser. A hot tub maintenance schedule is a great way to simplify the tasks that need to be carried out that will keep your hot tub running smoothly all year long. More importantly, you'll be ensuring that the water is safe for anyone enjoying the relaxing benefits. If you also own a pool it's a great idea to combine your pool maintenance schedule with your hot tub routine. We've put together an easy to follow checklist outlining the basics of keeping your hot tub balanced and ready to use. It should only be used as a guideline and shouldn't be relied on exclusively due to each hot tub being distinctly different. A resort owner in Costa Rica will require a different maintenance routine than a residential hot tub owner in Canada. Test your water frequently to stay on top of your hot tub maintenance and chemistry. Just be careful not to get caught in the over adjusting trap, adjust in small doses and test often! Sanitizer is the most important aspect of your overall maintenance routine and should be tested before using your hot tub or a couple times a week when it's not being used. The cover should be inspected for damage that would prevent it from keeping heat in and debris, pets, children and critters out. The water temperature should remain constant between 100˚-104˚F. A drastic fluctuation in temperature could indicate a major problem. Keep the water line above the hot tub intake or the water won't circulate properly. A spa vacuum or skimmer is a good idea if there is any noticeable debris on the surface or bottom. pH, alkalinity and salinity should be tested and kept within recommended ranges as often as possible. If these levels fall out of balance, a hot tub can very quickly become unsafe to use. Clean the water line and exposed shell with a cloth and hot tub cleaner or vinegar, especially if there is noticeable scum or debris. Inspect the filter and rinse with water or spray if necessary. A clean filter will help keep your water crystal clear and free or debris. Clean the filter thoroughly at least once a month with a specialized hot tub filter cleaner chemical. This goes beyond the inspection and rinse that should be carried out weekly. Cleaning the cover should include a wipe down of both the outside and inside surfaces. A dilluted bleach solution will help protect against mold and mildew and eliminate musty odours. If you fall into the category of having problems with calcium hardness issues you can increase levels with calcium chloride or replace some water with fresh water to lower levels. Drain and clean the hot tub at the end of season or yearly to protect your investment and extend the life of the tub and hardware. It's the perfect time to chemically clean the filter, shell and cabinet. A plumbing system flush is highly recommended every year to remove stubborn debris and even unwanted bacteria that can cause folliculitis. If you suspect your hot tub has contaminants, a flush can be carried out at any time by draining the hot tub of all water. A yearly inspection is a great way to head off any major problems that could have been prevented. A professional inspection will give you peace of mind knowing your spa is in great working order and good for another year of enjoyment. Test and balance your hot tub 2-3 times per week or more if necessary. Clean the hot tub filter every 2-4 weeks or more if necessary. Drain and refill the hot tub every 2-3 months. Add fill water when necessary. Clean and air out the cover 1-2 times per week. Use a non-chlorine hot tub shock every 2 weeks or as necessary. We hope you enjoyed this page detailing the important steps to complete hot tub maintenance. We promise that once you put in the time and effort to get your hot tub in top shape you're gonna enjoy it a lot more and spend a lot less doing it.